The Midwest League rankings feature the up and coming Jaff Decker who will reach San Diego far too late to save Kevin Towers his job. I never had a huge problem with Towers. He was far more handicapped (and successful despite this) by his team's ownership and budget than a frequent complainer like J.P. Ricciardi and his $100 million dollar losing squads. 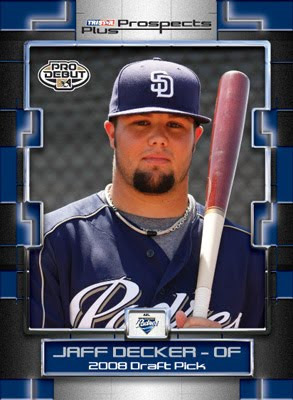 MLB Fantasy Prospects wrote a great piece on Jaff Decker that I may have mentioned previously, but if you missed it you should certainly check it out. the site is an excellent resource for the prospect crazy or just the committed Advanced Fantasy Baseball Shark in need of an edge. The big boy was no slouch this year at Low-A hitting .299, with 16 HRs, a .442 OBP, and a .514 SLG. Decker has a phenomenal eye that is indicative of a future fantasy star. He had a 19.2% walk rate and .92 BB/K rate batting third in the Fort Wayne (Padres’ Low-A affiliate) batting order. Notably, Decker has had a fairly high Batting Average on Balls in Play [BABIP] (.364 at Low-A /.432 in the AZL). Usually, such a high BABIP suggests a lucky hitter. In this case, there’s no luck involved, as Decker’s BABIP is sky high because he hits the ball freakishly hard. MLB Fantasy Prospects has recently reported on prospects like Derek Norris of the Washington Nationals, Hector Rondon of the Cleveland Indians, and Brian Matusz of the Baltimore Orioles.